I have a feeling I’m going to have a lot of people disagree with my opinion of Threshold. From what I’ve seen, it, and the author, Caitlín Kiernan, are well-respected by a lot of other authors, and she has a devoted fan base. I have to say, though, that Threshold is, at best, a poor attempt at a Lovecraftian novel that manages to read more like a pretentious Christopher Pike manuscript. The story starts out with a good introduction to Kiernan’s writing style. That was my first clue that I wouldn’t enjoy the book, and I honestly considered returning the book to the library. I hate to give up on a book, though, and the plot appeared to have some promise — we’ve got a young woman whose had most of the people she cared for die, one way or another, who appears to be in the grips of depression. Add to that Kiernan’s choice of nonlinear storytelling, and there’s a little bit of interest generated for me. So I stuck with it. What a bad choice that was. As I got further and further into the novel, it dissolved into a messy mix of geology, nonsensical horror, and story lines that don’t appear to serve any good purpose. Add to that Kiernan’s affectation of forming her own compound words (for example, scorncold to describe looks Dancy, an albino character, gets in the library), and you’ve got one frustrating piece of fiction. The plot, as it were, involves Chance, a young woman studying geology. She’s following in the footsteps of her grandparents, who raised her since the death of her parents. The book takes place after both of her grandparents have died. She has also had the recent suicide death of a friend. Her ex-boyfriend, Deacon, and his current girlfriend Sadie, come into contact with Chance when Dancy finds them in order to contact Chance. Fast forward a little bit, and we’ve got mysterious fossils that never get explained, malevolent creatures that are given no reason for existing, and some weird attempt at a tie-in with Beowulf. Let me tell you: Threshold is no Beowulf. The thought of it being referenced several times even kind-of made me angry. The book doesn’t manage to end in a way that leads to any sort of satisfaction, in my opinion. I don’t know if reading the rest of the series would provide that sense of completion, but I’m not really interested in spending any more of my time reading any more of Kiernan’s work. I’ll give her a point for writing about geology, and that’s about as high as I can go. I’ll admit it: I’ve become rather fond of Harry Dresden, the hero of The Dresden Files series. He’s always off fighting something interesting — rogue wizards, werewolves, toad-monsters … they’re all problematic creatures Dresden has to face. Grave Peril, the third installment in the series, covers a new type of supernatural creature — the ghost. The results are spooky and good at the same time. Jim Butcher starts off the book with Dresden and a friend, Michael Carpenter, going in to a hospital to stop a ghost from smothering the babies in the nursery. Michael is some sort of paladin — faithful, honest, strong, and steadfast — and his sword is an instrument for smiting evil. A surprisingly difficult battle with the ghost ensues after they pursue her to The Nevernever, as does a visit from Dresden’s godmother, Lea, who apparently owns his soul and wishes to collect as soon as possible. Added into this mix is the Nightmare, a sentient ghost-like creature that takes some of Dresden’s power, incapacitates Karrin Murphy, the head of Special Investigations for the Chicago Police Department, and enjoys taking people over when they sleep. We’ve also got significant vampire activity and the involvement of some back-story that provides for clever surprises with the plot. One of the attributes I like about Butcher’s series is the humor. I’m a sucker for puns, so I got a kick out of Dresden’s joke about the vampiress on a diet (“Make hers a Blood Lite”), among others. Yet this book felt darker to me than the previous two, and I wonder if some of that is because we’re getting to know Dresden better. It’s harder to joke around with characters when they’ve become established and people have developed attachments to them. The change toward a more serious tone isn’t bad, and Butcher still keeps his tongue in his cheek a good bit. This installment is just a little less so. A couple of things about this particular book made it a little more difficult to like. The first may seem petty, but it drove me nuts: Dresden says “Hell’s bells” a lot in this book. This is the first time I can recall him ever using this term. He says it, on average, one time per chapter. That would make for thirty-nine “Hell’s bells”. It’s not just the term, which I find mildly annoying; it’s also that I don’t think it’s something that the Dresden I knew from the first two books would say. Maybe I just overlooked it, but, in Grave Peril, the abundance of the comments jarred me out of the narrative each time I read it, which I’m pretty sure isn’t what Butcher was aiming to do. The second is that quite a bit of time, series-wise, has elapsed between the previous book, Fool Moon, and this one. That means that there’s a lot of back-story we only have filled in part-way — Michael has been his partner on the exorcisms, but when did they meet? How? What’s the full story on the big event that involved Special Investigations? Is it in a short story somewhere? Couldn’t it have been part of the story of this book? That would have been fantastic, and I wouldn’t have spent part of the book wondering why something was the way it was until it was explained through a narrative about past events. The Dresden Files is an awesome series. Grave Peril is a fine addition, but not quite as good as its predecessors. Believe it or not, I was aware of this book series before the television series. I just didn’t get around to reading it. I have watched the series, though, and liked it. This book, the one that started it all off, demonstrates that Dexter the television series is faithful in tone. Darkly Dreaming Dexter has a significant amount of wit mixed in with its gore, with a more nuanced and compelling plot than the first season of the series. The book starts off with Dexter stalking and eventually killing a priest who had been killing orphan girls. It’s a definite shock to the system. I know it’s a relatively common strategy on the part of thriller and mystery writers, but Dexter’s murder gives us insight into what exactly drives his homicidal tendencies — his Dark Passenger. This component of Dexter’s psyche is essential to understanding what he does, and I think it’s a part of his personality that gets pushed aside in the television series, much to its detriment. Dexter’s Dark Passenger is a torment for him in a way that is difficult even for him to effectively describe, even to his trusted father Harry. Having to feed the urges of a part of yourself that seems so foreign in order to drive it back for respite — that must be extraordinarily difficult. The work is something he enjoys, but is it truly something he would have chosen to do if it weren’t for that Dark Passenger? That question is raised toward the end of the book in a rather painful, but well-done, way. I found the choice of first-person narrative here really effective; I don’t think Darkly Dreaming Dexter would work any other way. We need to be in his head in order to understand, for sure, but we’re also being tricked into sympathizing with a serial killer. He’s shown to be witty, smart, and scrupulous. He’s also naïve in an almost child-like way about interpersonal relationships; he’s had to study to figure out how to be a normal person, and the gaps in his education are both awkwardly painful and oddly endearing. Lindsay does an excellent job of making the reader root for someone who, in another author’s hands, could well be the villain. My only issue with Lindsay’s book is that it is sometimes too clever or too cute. There’s a lot of alliteration, which I got tired of after a while. It’s a good technique for a slogan; it’s not so great as part of the narration. It almost always jarred me out of the story, which is not a good thing. I wanted to be engrossed, and this just made it impossible for me to fully immerse myself in the plot. The bottom line, though, is that Darkly Dreaming Dexter is an excellent example of a thriller with humor. Lindsay gives us an original idea and follows through extraordinarily well. I’d be happy to read the rest of the series; I think there must be a lot more to Dexter’s story that the television show just can’t provide. Hyperion, the first book in the Hyperion Cantos series by Dan Simmons, is simply brilliant. It has all the normal features of a science-fiction book, yet Simmons manages to give the reader more than that — he flexes his writing muscles and provides a book that melds literary traditions to create a work that is beyond a “mere” piece of genre fiction. The book starts out with the beginning of pilgrimage to Hyperion, a planet at the edge of the system of worlds underneath the interplanetary governing body Hegemony’s reach. No one seems particularly happy to be going; after all, the creature-god they are going to appease will most likely just kill them all. This doesn’t make for the happiest of groups, but they manage to get along well enough without real violence. In fact, it is suggested that they spend their evenings telling each other their stories. This is part of Simmons’ particular cleverness — he has incorporated the basic structure of Chaucer’s Canterbury Tales. Each man or woman tells his or her story, and how they are connected to Hyperion and its bloody Shrike, an inhuman killer made of both flesh and metal. The creature has a church dedicated to him, the locals fear and have a mythology that revolves around him, and these pilgrimages typically don’t go well for those who partake. Thus it is comforting for our seven travelers to hear everyone’s stories and to attempt to connect them together. Our first story, that of the priest, is a standard sci-fi horror story of a foreigner put into a culture he does not understand until it’s too late. The second, that of the military man, was also horrific, but in a different way — it’s an almost-sad tale of a man allowing his loneliness to lead to the release of both lust and bloodlust — and to becoming, for a time, the tool of the Shrike. The third story, that of the poet, is disturbing in its candor in disclosing the mind of a madman. He needs the Shrike in a way that others in the group find abhorrent. The fourth tale, about the Wandering Jew, is sad — it’s a family and medical drama that is both touching and desperate. The fifth, that of the pilot who brought them in, is mysteriously absent. This is because the man is mysteriously absent. The sixth story is a detective story through-and-through, very well-crafted and very well-told. The seventh and last one, that of the consul, exposes the most about why events have turned out the way they have. I just love the structure of this book. There’s the Chaucer element, but the material about their actual voyage is also fantastic. There are power struggles, the interactions of the people fit the characters they expose through their stories, and the actual trip is interesting, instead of being a mere vehicle for the pilgrims’ stories. I’m happy that there are more books to read in the series. Simmons has proven to me how inventive and effective a writer he can be, and I can’t wait to read another of his works. Like many people, I’m on a budget. 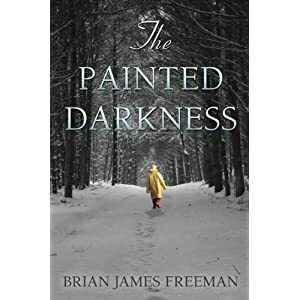 Entertainment is one of the things I cut first when money gets tight, so I was happy to find The Painted Darkness as a free eBook. The plot sounded interesting, and, though I’d not heard of the author, I thought I would give it a shot. Unfortunately, Freeman’s novel fell flat for me. The main issue I have with The Painted Darkness is that I don’t feel like Henry, the main character, is well-constructed. Freeman doesn’t even give him a last name, as far as I can see. We don’t see him interact with people, for the most part. We find out that he’s an artist, but other than that, there’s nothing that gives us insight into the character until, arguably, the very end. Whether the reader feels that the little he gives us there is satisfactory is up to them; for me, it was not. Henry feels generic in the extreme. A secondary problem with The Painted Darkness is the split structure. Freeman takes us back and forth between Henry at five years old and Henry today. While some books employ this tactic in an effective way, the present-day plot line, in my opinion, relies too much on what happened while Henry was a child. Spending more time with the childhood story before starting to intersperse the adult Henry would have been a much more satisfactory way to present the novel as a whole. The Painted Darkness also has a problem with predictability. I was able to guess at a lot of the events before they occurred. While that might mean I’m a genius, I somehow doubt it. I like to be able to feel sometimes clever by being able to predict one or two things ahead of the reveals. I don’t like knowing the ending when I’m a good ways away from it. The last main drawback to the book is the overall quality of the writing. I feel bad for saying this, but, for someone who has apparently published at least one other novel and several short stories, his word usage is not good. While I was reading, I noticed a lot of things that prevented me from enjoying the book. This is not a good thing. I’m not saying I could do better — on the contrary, I don’t think I’d fare much better if I were writing a piece of fiction. I just don’t think I have that in me, no matter how much I wish the opposite were true. As the old adage says, however, I don’t need to be a chicken to know what an egg is. I have a feeling that Freeman is, like a lot of us, full of great ideas. His execution, however, leaves a lot to be desired. I am a novice reader for this book in a couple of senses: I do not read many translations, and I also do not read many books older than I am. I believe this might be a major reason why I didn’t thoroughly enjoy this book, which was generously provided free of charge as an eBook by the translator. One of the big issues I had with the book is that I don’t know a lot about how Germany was around the turn of the century. A lot of the geography, politics, and culture are foreign to me, and the book flows as if the reader is intimately familiar with the setting already. I think this might be why the author is not well-known today; what separates truly great works from those that have their set place is the ability of the author to create something that rises above the mundane and everyday to find at least one universal truth to stand upon in order to be understood outside its time and location. The story itself has an interesting pace, at times moving quickly from event to event, at other times slowing to allow some suspense to build. It’s an odd plot, to say the least — feeding both a fear of science and a fear of folk magic, I think — that mostly works. The one fault, I feel, is that there really isn’t someone to identify with. The title character is mainly to be alternately feared, loathed, or pitied, but so are the people who become her victims, for the most part. If they aren’t one of those three, they’re too-small a character to participate in the action. The translation, I thought, was fairly good. I have a feeling that most of the issues I have with the written word was the fault of Ewers’ word choice in the original German, and not with Bandel’s interpretation of his words. Overall, I feel that, if I were better educated or more experienced, I would have pulled something more out of this book. A twenty-something woman interested in everything to various degrees, and will read to prove it. Libwen Reviews · An unreformed reader’s book reviews.